SEBASTIAN – Hurricane Irma is a potentially catastrophic Category 5 storm as evacuations are getting underway this Saturday at 8:00 a.m. in Indian River County for low lying areas, substandard housing, areas east of U.S. Highway 1 and the Barrier Island. Spaghetti models show that Hurricane Irma could be a Category 4 storm by the time it reaches landfall near Miami. The storm will continue to bring life-threatening wind, storm surge, and rainfall hazards as it makes landfall this weekend in Florida. Mandatory evacuations for Sebastian, Vero Beach, Fellsmere, and other parts of Indian River County will begin Saturday at 8:00 a.m. Emergency Shelters will also open on Saturday at 8:00 a.m. The mandatory evacuations in Indian River County are for low lying areas, substandard housing, areas east of U.S. Highway 1 and the Barrier Island. “A local state of emergency was declared by County Administrator Jason Brown at 1:00 PM today. All Indian River County Offices will be closed on Friday and Monday. Most banks and stores are closing Friday at noon. Voluntary evacuation orders are in effect for low lying areas, substandard housing and manufactured homes, and those who may be impacted by storm surge such as the barrier island and areas east of US 1. Mandatory evacuation for those areas will begin on Saturday at 8:00 AM. 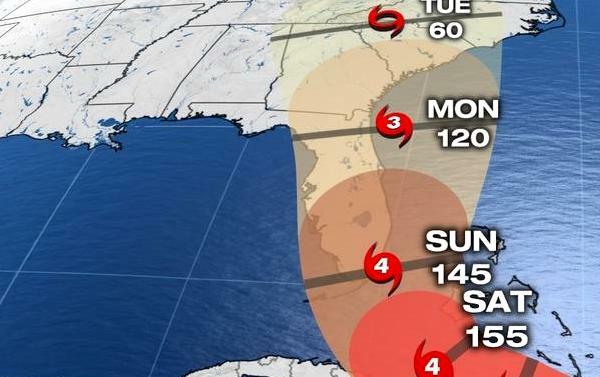 Emergency shelters will open on Saturday at 8:00 AM,” the Indian River County Emergency Operations Center (EOC) stated. Shelters will be Freshmen Learning Center, Oslo Middle, Sebastian River Middle, Fellsmere Elementary, Liberty Magnet (Pet-Friendly), and Treasure Coast Elementary. “I wish the best for everyone, make sure you all listen to local authorities as they have the best information in real time. Be safe,” Sebastian City Councilman Jim Hill told Sebastian Daily. The threat of dangerous major hurricane impacts from Irma in Florida continues to increase. “A hurricane watch has been issued for South Florida, the Florida Keys, Lake Okeechobee, and Florida Bay. This watch will likely be expanded northward later today. Residents in these areas should heed any advice given by local officials,” the National Hurricane Center stated. A storm surge watch has also been issued for portions of south Florida and the Florida Keys. This means there is the possibility of life-threatening inundation from rising water moving inland from the coastline during the next 48 hours in these areas. 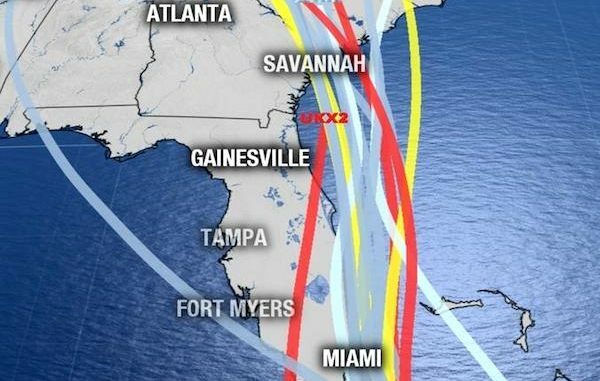 Hurricane Irma spaghetti models show an impact in Sebastian and Vero Beach. Spaghetti models from both U.S. GFS and European continue to show potential impact from Hurricane Irma this weekend in Sebastian and Vero Beach. Please prepare now. Indian River County residents should take this storm very seriously. Please prepare for a major hurricane in Sebastian and Vero Beach. In Sebastian and Vero Beach, most businesses are boarding up Thursday and Friday. “We will run through Karaoke. Our kitchen may close early as we may run out of food,” John Campbell, Tiki Bar & Grill owner, told Sebastian Daily. Those in mobile homes, such as Barefoot Bay, should find shelter. Please do not take any risks by staying in your mobile home. Most mobile home parks have a shelter, which is true in Barefoot Bay in Micco. Please take this storm seriously in Brevard and Indian River County.